One of the tools that you will need for your first or next goose hunt is a good goose call. Granted, it’s more than possible to have a successful goose hunt without using a call; hunters do it all the time. That being said, there’s also no denying that using a goose call will help make your hunt far more likely of being successful. You see, if you’ve gone goose hunting before, you know it can be more difficult than it sounds. You sometimes have to wander around for hours in mushy marshland and get soaked up to your hips. If it’s raining, well, you’re going to get soaked everywhere. But you can greatly reduce the amount of time you have to spend wandering around in that kind of environment if you invest in the proper equipment, such as a goose call, to attract the goose to you rather than you having to chase them around endlessly. Geese are also far more complex communicators than most people realize. For instance, did you know that they use around two dozen notes and sounds to communicate with one another? What Types of Goose Calls Are There? Obviously the mouthpiece is the piece that is placed against your mouth to blow into. The insert is on the opposite side of the call, and it holds the wedge, tone board, and reed, which are essentially the internal pieces of the call. While most goose calls are comprised of the above components, there are still different basic types that are available as well. Resonant Cavity Calls are usually built out of polycarbonate or wood. The reed is long and fixed over the tone board, and then held down by the wedge. In general, the resonant cavity calls is the easiest type of call to use, which is why they are the best choice for beginners. The main disadvantage to a resonant cavity call, however, is that the number of goose sounds they can mimic is rather limited. Furthermore, the volume of the call is usually much lower as well, which makes them a poorer choice for reaching out to birds at longer distances or in windy or loud conditions. Flute calls offer a much larger variety of sounds and pitches than the resonant cavity call does. This is because the mouthpiece is longer than most other goose calls., and it also has a flute style of insert that creates a back pressure to create a larger number of goose sounds. The only downside to the flute call is that the design of it can make it difficult to control, which is why a variant of the flute call called the ‘short reed’ that is easier to control. Speaking of which. Short reed calls really are an entirely new category of goose calls on their own. They were made popular in the late 1990s, and remain a highly popular choice today, with literally thousands of different options for you to choose from. Short reed calls, as the name suggests, have a shorter reed, which actually has a huge impact upon the quality of the call that is created. Generally speaking, the farther the reed is from the mouthpiece, the more control you have over the sounds of the call. The trade off is that the call tends to be deeper rather than pitchier. Next, what are some qualities that you need to look for in a goose call? The overwhelming majority of goose calls built today are made out of plastic or wood anyway, so it shouldn’t be difficult for you to find a goose call made out of those materials. Both are good, with wood definitely creating a softer sound and plastic creating louder sounds. In addition, plastic or polycarbonate goose calls are more durable than wood because they will not shrink or crack from water or moisture. That being said, plastic is also not as refined or as ‘nice’ per se as wood is. But in short, either is good to go with. It really comes down to personal preference. Goose calls are hardly expensive items, and you should have no problems finding one within your budget. That being said, some goose calls can get to be very expensive, as in one hundred dollars or more (for the hand crafted models). For a factory produced call though, there’s absolutely no reason to spend that kind of money. You can easily find a high quality and inexpensive call within your price range, and as we will soon see, there are many high quality calls from reputable manufacturers that you can buy for only around twenty dollars, if not even less. Last but not least, your call should be able to create a wide variety of sounds as well, including both high and low pitches. Remember that geese are fully capable of making nearly two dozen different sounds, and you want a call that can mimic as many of those sounds as well. Buck Gardner is a fairly big name when it comes to game bird calls, and the Canada Hammer Call is so named from the fact that geese migrate to the south from Canada. You’ll notice right away that the Canada Hammer call has a bourbon color and a reed that is very smooth due to the fact that it is hand shaved so it performs sort of like a musical instrument. Today, it is much more rare for a goose call to be hand shaved, so this in and of itself is special. The rest of the call is also clear, so you can easily view the internals of the call. This call is also very affordable, and can be purchased for around the twenty dollar mark, which should easily fit into even the tightest of budgets. In addition, this call is also hand tuned, which despite the low cost of the call makes it even more valuable for the any goose hunter. The Honky Tonk Call from Bushnell performance is perhaps the most surprising entry you would see on this list, since Bushnell in general is more known for building optics for firearms. That being said, Bushnell is also well known for making high quality products, so it should at least be worth looking at. Indeed, the Honky Tonky is built out of high quality and weather resistance products, and is designed to work extensively in both very hot and cold environments. This call uses the short reed design that also allows you to Crete a wide variety of different calls, and again, Bushnell made sure that the call would work in a wide range of different environments. Last but not least, this call also has the distinction of being very simple and easy to disassemble and cleaned, which is not something that very many other goose calls can do. As we discussed previously, flute calls were all the rage before short reed calls came into immense popularity during the late 1990s. If you are looking for a flute goose call, you’ll want to look at the Flambeau Max 4 Long Honker Goose Flute Call. This call is very well adept, if properly used, at creating a deep and bellowing call over a wide area such as a marshland or a lake, so they can reach out to geese at longer distances. Flambeau also constructed this flute call out of synthetic materials to help it create that more realistic sound than wooden calls can. 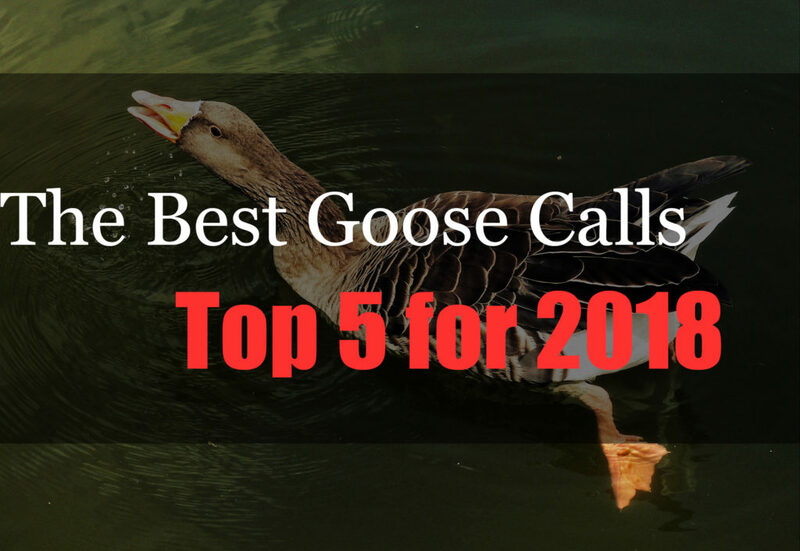 The main downside to this call is that it is of a larger size than many other types of goose calls on the market, including some of the other ones that we are going over in this article, so it won’t be the easiest or lightest to transport around in a coat pocket. Without question, this is one of the best calls to use for attracting Canadian geese, and it also comes at an affordable price. In fact, this call can be easily had for less than twenty dollars, which should fit in the budget range of most if not all goose hunters. Primos is also probably the most recognizable manufacturer on this list, as they produce a wide variety of calls for different kinds of game. In other words, this is a company who has mastered the art of perfecting wildlife game calls for hunting. That being said, this is also a call that is going to appeal more to beginners, and it allows the user to create more advanced goose calls with extreme precision. In other words, using this call is going to require a little bit of extra effort and practice on the part of the user, thanks to the flex end hose that creates automatic back pressure. Another advantage to this call is the fact that it is very easy to disassemble as well. Many people fear disassembling their goose call due to the fear that they will accidentally or inadvertently damage the call. The simpler a call is to disassemble, the less there is a chance of that happening. Last but not least, the Zink Power Clucker PC-1 is another excellent goose call on the market as well. This is a short reed call that is built out of polycarbonate, and it is tunable by hand. This makes it a favorite option among goose hunters across North America. That being said, hand tuning may not even be necessary, because this call also sounds great right of the box, and is capable of creating a number of high and low goose sounds. The shiny chrome center of this call also gives it a rather attractive look to it, though you want to be careful that the center of the call will not reflect in the sunlight (as this can cause birds to turn or fly away rather than come to you). Last but not least, another big benefit to this call is that it is actually hand tuned, which is not something that very many other calls in the market today can claim to be. If there’s anything that you take away from this article, it’s that goose calls are hardly complicated. On the contrary, they are incredibly simple devices that can work wonders to make your next goose hunt significantly more successful. Now that you know what the different types of goose calls are, the qualities to look for in each one, and five of the best makes and models on the market today, you are well armed with all the information you need to get the best goose call for you.